Vali died last week. He was absolutely the best boy in the entire world and we miss him dearly. Valentino came to us 16 years ago. He was a gangly little puppy who had escaped from his yard. My husband saw him and tried to make friends, but Vali was very shy. It took several hot dogs and lots of pets before he decided it was ok to give in and get in the car. My husband called to tell me he had found a little black dog and wanted to bring him home. 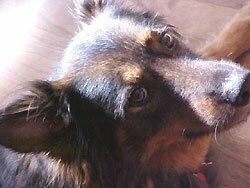 I was picturing a pure black terrier weighing about 10 pounds - what I saw was a brown and black German Shepherd/Chow mix weighing in at 35 pounds. The vet swore he wouldn't get much bigger, but a year later brought an additional 30 pounds. We weren't sure what we were going to name him, but I took one look at those gorgeous brown eyes and said it had to be Valentino. And so it was. Vali had a wonderful temperament. He loved life and loved his family. He protected us but was always friendly with others. And he got along well with all of his brothers as each little rescue joined our brood. Well over a year ago Vali developed cancer. The doctor felt he would probably be with us for just a short period of time. But to our amazement and pleasure Vali proved him wrong and stayed with us until a few days ago. We were so blessed to have had him in our lives and we will never forget him. While he was still able to navigate the yard fairly well, he discovered the "jungle". This was a garden area that had been previously fenced off from the backyard, but when we put the new fence in we pushed it forward to allow this additional area for the boys to enjoy. It was one of Vali's favorite places to nose around in every chance he got. It was only fitting that we placed him there along with his brother Beau who left us just about the same time last year. We love you Vali and we'll look for you in the jungle. Happy Gardening.